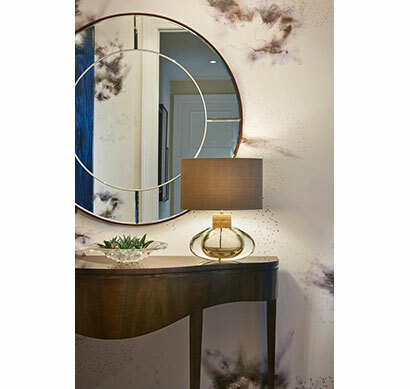 Ken Walter is praised by clients for his versatile take on transitional style, suffused with understated elegance and character. With roots in traditionalism, extensive high-end experience and strong vendor relationships, Walter is entrusted to give a contemporary edge to what's tried and true. Starting with a light backdrop—typically earth tones or neutral grays—the designer elevates the vision using bold elements—black marble, copper—in the hardware, and saves his traditional touch for the decorative details—gold overlay, faux finishes, custom drapery. Longtime clients whose own design senses have evolved over the years say Walter updates their homes with the same sense of grace and style, showcasing his vast knowledge and flexibility. Walter's late partner Ann Gray began the firm in 1971 after training with New York's esteemed interior design firm, McMillen. Walter joined in 1981 with years of commercial design training in Atlanta, Los Angeles and Chicago. Residential Chicago clients have included many a CEO living in the Gold Coast or Lincoln Park, and these clients tend to have second homes further afield, also dressed by the firm. Commercial projects have included The Little Nell in Aspen, The Tremont Hotel in Chicago, The Ritz-Carlton in Washington, D.C., and The Standard and Mid-America Clubs in Chicago. The firm is said to approach each job thoughtfully and specifically, which often translates into a substantial investment in time and resources for the client. "Ken is bright, intelligent, articulate, responsive and candid." "He has an uncanny way of drawing out exactly what you are looking for even when you don't know." "Ken is meticulous, on top of every loose end and very communicative." "I was a little nervous when Ken did not want me to review our rather large living room in its various design stages, but I give him an 'A' in everything he did with it." "They took my stylistic preferences to heart." "Went above and beyond expectations to get our project done on-time and on-budget." "They did a great job of making the house beautiful, yet also comfortable and livable for my young children." "[Ken] will protect you from your own bad judgment." "He strikes the perfect balance between valuing your opinion and moving the project along."